Razel CAF (AHR 23987-04) is a 6-year-old mare sired by Arno and out of the mare, RazzleDazzle NTF. Arno, one of only two AHR ‘Elite Status’ stallions in the county, who has also been 4-time AHR ‘Stallion of the Year’ and 2-time ‘AHR National Champion Stallion’, needs little introduction. RazzleDazzle NTF is sired by Afghan III NTF and out of the famous Ramblin Rose NTF mare line. This mare line has produced many show stoppers and sale toppers. Razel was AHR Silver Classified in 2007 with 76 points. She was the highest scoring horse at her inspection site that year. The highest inspected horse that year though was 78 points. Razel was successfully shown by Genesis Farm as a yearling. She was ‘Champion Yearling’ at the GLHA Futurity that year, among other titles. Since that time, she has raised two beautiful fillies. Razel is an athletic and forward moving mare. At the same time, she is very gentle, with a personable and willing attitude. Above all, she desires to please her handler. Her great temperament makes her steady and calm in new situations. The typical ‘spook hazards’ that alarm most horses like traffic, pedestrians, barking dogs, trashcans, etc, don’t even receive a second glance from Razel. She is well started under saddle and very well trained to drive. Michele loves driving her up and down the roads! 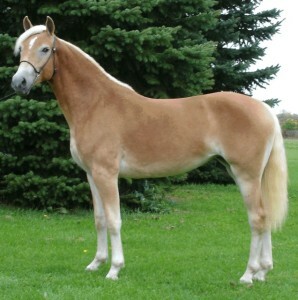 Razel made her performance show ring debut at the Great Lakes Haflinger Show in August 2010. This was Razel’s first show under harness and under saddle but she didn’t waste any time in finding her way to the winner’s circle! Razel and Michele won their first class of the day, Pleasure Turnout, and throughout the day in every class they entered together they never placed lower than 2nd place! Pretty impressive for this mare’s first riding and driving show! Molly, our junior handler, won the competitive “Youth Pleasure Driving” class and she had not ever driven Razel prior to the day of the show! Razel also took 2nd in the youth walk-trot pleasure class and 1st in the youth walk-trot equitation class with Molly aboard!